Local Kansas City long-distance walker and blogger, Scoot, has a great post on his top 20 bars. This question I am frequently asked in America, simply because I am Irish, is one of the most stupid. Learn Irish in Kansas City? My sources tell me that Irish language classes are under consideration for Kansas City’s Irish Museum & Cultural Center (IMCC). On Thursday June 21, 2007 Seven Nations are playing Davey’s Uptown Rambler’s Club in Kansas City, Missouri. Boys and girls, we have a date. And that’s all I can say for now. There’ll be more nearer the time. What time? This time. 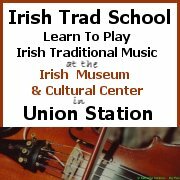 The Kansas City School of Irish Music has now finished the Winter/Spring set of classes. So I walk into an Irish pub, an authentic Irish pub no less. The pub is located in the prime shopping district of a foreign land. Of interest to Irish Trad fans in the Midwest is a great offer on CD Baby right now on Bohola CDs. The story of an Irish cross. It starts in Kansas City and it ends in Kansas City. • Kerry, Meath and Donegal in bed together? • Where in Ireland is Glasgow? Here’s your Sunday Short film for you. How Derry Began. Memorial Day Weekend in Kansas City. Some Irish events for you. Ten blocks from the Uptown Theatre they were easy to spot. It’s time again for Kansas City’s little Irish festival that is the Celtic Block Party in Waldo right by Brookside. Over the last year we’ve featured Ireland’s Balcony TV here on Irish KC quite a few times. Go to Southwest Boulevard. Scramble up the hill on the north side. And Sketch.